Lentils, rice, veggies and LOTS of herbs and spices make this one-pot meal a dinnertime champion! Not only are they easy to make, but they are easy to clean-up after. I’m a bit of a train wreck when I’m cooking. I try to clean as I go, but it is a rare occasion that I don’t leave the kitchen a mess by the time I’m finished. Tonight, I kept the mess to a minimum because all of the delicious could be handled by one knife, one cutting board, and one pot. Plus, since it needed to simmer all by its lonesome for fifteen minutes, I had time to drink wine get the kitchen in order before dinner. This was just a warm bowl of hearty, vegetarian deliciousness. The recipe couldn’t be simpler: prep your ingredients, add them one by one, stir it up, and let it simmer. You guys know all about my spice addiction, so you won’t be surprised to find out that this dish is seasoned with coriander, paprika, turmeric, cumin, and cinnamon. In addition to the spices, I also used some fresh ginger and garlic to really send the flavor profile over the top. To bulk up the dish I added potato, onion, and carrot. Basmati rice and brown lentils make the dish thick and filling. I shared this one pot lentil dahl recipe on the blog nearly 4 years ago, but since then I’ve made lots of little changes and perfected it to my liking. It is definitely time to re-share the recipe and update the photos! I hope you love it as much as I do! 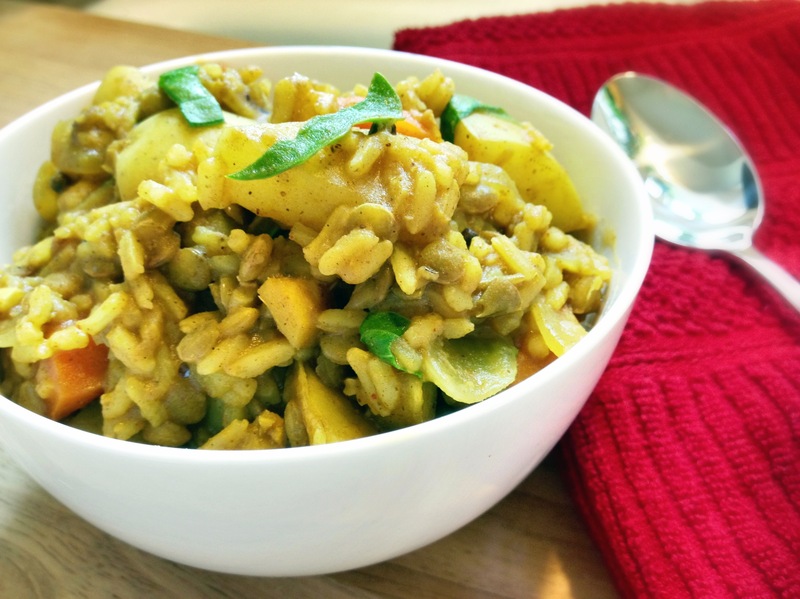 One pot is all you need to prepare this spiced lentil and rice dish. Easy and delicious! Measure out the proper amounts of coriander, paprika, turmeric, cumin, and cinnamon; place in a small bowl. Heat the oil in a 6-quart dutch oven over medium-high heat. Add the onions and ginger to the pot and saute until the onions become semi-translucent, about 2 to 3 minutes. Add the garlic along with the pre-measured spices. Add the lentils, rice, and 3 cups of water to the pot. Bring the contents to a boil, and then reduce the heat to low and simmer for 18-24 minutes, or until rice, lentils, and potatoes are cooked through and no excess liquid remains. Garnish with cilantro and serve with limes and warm naan or flatbread. Originally posted on June 26th, 2013. Updated photos and recipe for clarity on February 27th, 2017. Looks good! Had to not added vegetables and kept the spices to a minimum, you would have made a traditional khichdi! How funny! This was just another classic "what do I have in the pantry?" dinner. I'd love to try out some more traditional recipes soon. I adore using spices - so much flavor with so few calories! I'm with you on one pot meals, they are best and I love what you have done here. Sounds so delicious. I have always love lentils and rice and your spicing is fantastic. A divine & well-flavoured nutritious dinner! Yummy! Just wanted to tell you I made this a couple of nights ago and I'm so in love with this recipe. The cinnamon and brown sugar had me feeling a bit skeptical, but this dish is delish. Thank you for sharing! I used honey instead of sugar and substituted half of the white potatoes for sweet. It was absolutely delicious. Next time I'll up the heat with some red pepper flakes. I just made this, and it's delicious and nutritious! Thank you for sharing this recipe! I'm going to make this again and again! I was wondering about the cooking time -- it seems short. Do you soak and cook the lentils and rice ahead of time? Nope! 18-24 minutes should be good for both the lentils and the rice. The lentils don't need to be mushy, just soft.